To make sure you get the best deal we'll show you great prices from all of our drivers, including ELYES MAN VAN, if they're available on the day of your move. Have a question for ELYES MAN VAN? No problem, send them a message and they'll email you back as soon as possible. If you have a more general question you might find it answered in the FAQ, or you always contact one of our brilliant customer service team. * ELYES MAN VAN won't be able to see your email address. Very professional, helped move our items efficiently and with great care. Was great to work with. Only reason they didn't get 5 stars is because they were half an hour late and didn't call until about 10 minutes before the scheduled move time. Apart from that, thoroughly good company. Would recommend! Definitely will recommend them to my friends for removal service. The driver was 30 minutes late due to heavy traffic. He didn't have change the money we paid. The movers were 35 minutes late and called shortly after they were due to arrive saying that they would be late due to traffic. I am not sure if they had straps and blankets, though it didn’t appear so as they didn’t use any for my wooden furniture, which resulted in drawers of my antique dresser falling out and to the floor mid flight of stairs. Generally nice individuals though I expected a higher standard of care and service. 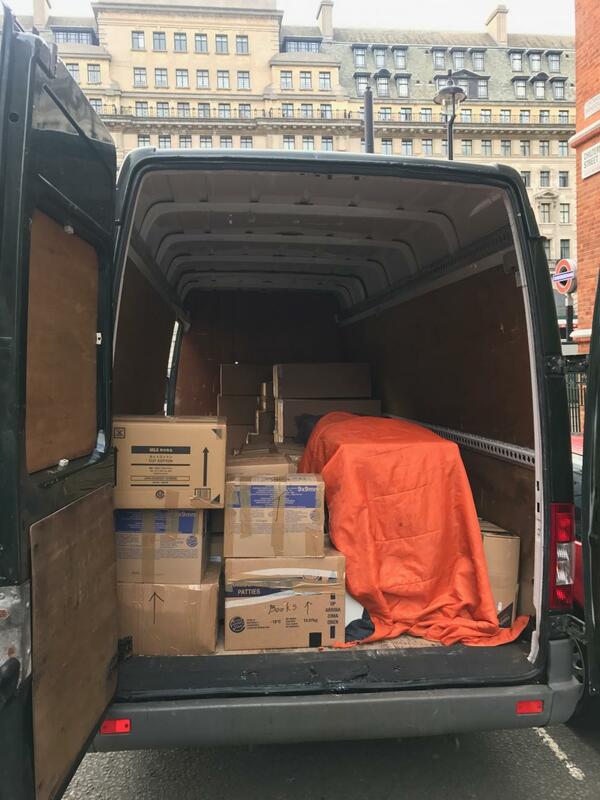 The driver had a serious attitude problem, on asking if he had insurance he threatened to cancel the job and every item he placed in the van he complained and showed already present scratches. The worst for me was that one of the chest of drawers was chipped which I did mention was very delicate and will chip easily. Further, that chip was covered with masking tape. They could have just told me rather than trying to hide it with masking tape. Really disappointing. All the leather sofa and 2 of the dining chairs were scratched, which could have been easily avoided if they were covered with blankets properly, at least the chairs and the removeable back of the sofa could have easily been covered. The back of the chest of drawers had a hole in it because the thing pushed in the front of it just went through. One of the glass top of a table which was wrapped in a rug never made it to the house. That rug had emotional sentiment and losing that was just awful. Again even after messaging to check where it was, I was told it was left in the house, which can't be found. I really don't care about the table but the missing rug is very upsetting. We were moving to our new house and I understand that some of the things would be scratched and chipped but things like the front door which was wide enough to not have been scratched were scratched. In short this job just lacked the common curtsey and the respect for others property. On the positive side, we had a super king size bed and mattress which I was dreading and they managed to get it up the 2 stories. For that I am very thankful. It was a very difficult and tricky thing which was eventually done. I am sorry to hear that you were disappointed with the job. Id also like to note that my comments with regards to my insurance were not made out of bad attitude. Your furniture was old and fragile, your initial question for me was whether I had insurance. At this point I kindly offered for the job to be cancelled, as I did not want to be in a situation where we had to identify existing damage to very old furniture. You insisted on the job being done, despite the fragility and heavy furniture to be moved, we worked very hard to get the job done effectively. With regards to the glass and rug, they are both in good condition, with my helper and will be delivered to your home address. Ultimately, from the beginning, it was made clear that an insurance claim was to be made. Out of my good nature, I carried out the job and nothing was lost or damaged. We worked hard and I am disappointed to learn that despite you seeing all the hard work, you still found reason to be unsatisfied. I do hope you are more assured knowing your sentimental rug is safe and will be delivered to your home. Elyes man van was incredibly helpful. Service was excellent and the driver helped with loading and unloading. The road was busy at the destination but this was eased by the driver's experience. Late due to traffic not their fault. He was hilarious! Made the move so much fun and really took the stress out of it. Highly recommend. 30 minutes late as prior job had overrun. Helpful and did a good job. I did not request straps and blankets. The driver was professional and fast. I would definitely use him again and recommend his service. Helpful, friendly, efficient and made the moving process much less stressful. Would definitely book again and would highly recommend. Thank you! excellent service throughout!! highly recommended driver. Very efficient service, loaded and unloaded at new house all in about an hour. Would definitely recommend them. Friendly driver and companion who provided all help needed and would without question use again. Unfortunately he was an hour late (he did call long before to tell me though). In the end though, he was really helpful and also gave us a lift back to our old house at the end so we could pick up our bikes which was out of his way. So we really appreciated that. Would definitely use these guys again. Very professional, friendly guys. Great job! Driver was wearing headphones while driving which made me feel unsafe. He was great, really friendly, very efficient and helpful. We would definitely use him again. Despite being just the driver and I (I did book for two people) we managed very well and to make up for the lack of assistance he took some extra items and helped me to carry some things upstairs. On the whole it was a very good experience. Very good service - punctual + friendly! I gave only 4 because of an hour late but everything was done nice quick. It should have been 5 otherwise. The driver and helper are both respectful. They were prompt and very courteous did the move a lot quicker than I thought....can’t recommend them highly enough. Thank you for making my move so painless and easy. Everything was packed perfectly into the van. Couldn’t be happier. Very pleasant team and willing to help. Greatly appreciated. Elyes was running a bit late but called to let me know so this wasn't an issue. The moving was rather quick and smooth to be honest, we wrapped up in less time than booked and his large van fitted everything we had which was quite a lot. Would recommend if you have any big and quick jobs to do! Thanks. Friendly, gentle with move, professional. Can’t say anything bad. Very personable and keen to make the move as easy and stress free as possible. Very reassuring. These 2 guys were brilliant. It was a very hot day and I think we had more than what they anticipated (our error) but they were fantastic, fast and careful. Very polite and professional, and was willing to help considering that I did not book the Help option. Would be happy to use this service again! All worked perfectly! 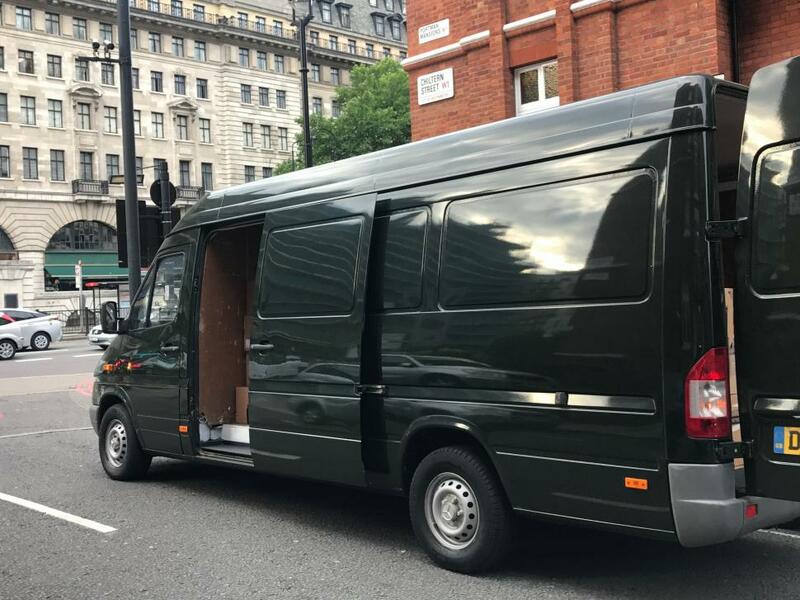 I hire the Van from the site because they are respectful and responsible drivers so will keep using them even thought they are late sometimes. The service I received was fantastic and I would highly recommend our driver to everyone. He was on time and super helpful. Even before I booked, he was very responsive and helpful. Really impressed by he overall service, both from the driver and Comparethemanandvan! This driver was ok, all went well but after we had to step in and ask for the van to be reorganised. 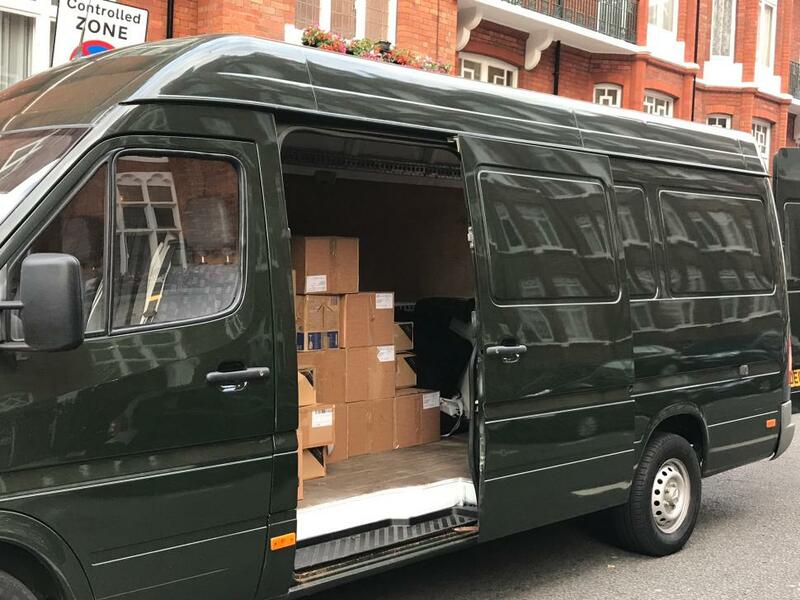 The packing of the van was done in such a manner that half of it was empty, while only half of the packages were loaded. Aftee a short discution reorganised and all was put in. Arrived quite late; due to traffic. Destroyed part of the neighbour’s driveway and didn’t tell me even though I’ve asked him - the neighbour showed me on cctv. The driver was a true professional who knew exactly how to manage and stack goods. I would have no hesitation in reccomending him to others. Of equal importance is the vital part your organisation has played in allowing me to make an informed choice, so my thanks also goes to you. Fantastic service - the driver turned up bang on time and the whole move was incredibly smooth and straight forwarded. Will definitely use this company again! New build now has a chunk taken out of the doorframe. Top notch. No problem whatsover. I booked a 2-man job, they showed up on time and they loaded and unloaded everything for me. The driver was very alert and respectful. Overall I would recommend this can to all in need. The Man and Van ltd, promised we could pay deposit on card. Then that we could pay in full on Card or cash. This wash not true. We could only pay cash, which was then a nuisance. If you wish to pay the balance of your booking via card, you able to do so over the telephone when we will be happy to take payment. Good service. No complaints. The only thing I would say is that it was a good job that I had a good supply of hand tools, without them the move may have gone less successfully. Hi, our driver was 1.5h late. It was only after I called him that I learned he had a flat tyre and stuck in traffic on top of it. So we had to wait outside with all our stuff in the cold, as he kept on saying he'll be arriving soon. Therefore we would like to request a full refund. Otherwise once the driver arrived, he was polite and completed his work professionally. Very very happy with the service & friendliness - many many thanks!! The driver arrived 15 late , then he was asking extra half hour pay because we unload the van 10 min passed actual time. We are sorry that the driver was delayed by 15 minutes to your booking, however, your booked time will only ever begin from when the driver arrives. If you then go over your booked time, the driver's half hourly rate will then apply. Was half an hour late but such a helpful pair of drivers! Moved my belongings quickly and efficiently and overall had a great experience. Would really recommend! Arrived on time, helped me through a complication, good service. On time. Van as described. Drivers friendly and knowledgeable about the order and how to pack items in the van, whilst proving support and avoiding damages. Came with blankets but no straps (we had some anyway). Very quick. Went from Reading to Bracknell (15ish miles) and all done within 2 hours. We have asked the driver to contact you directly. A very accommodating person would definitely use him again . Lee was very lovely and so helpful! He did most of the heavy lifting for us, worked quickly but carefully, and really helped make our whole move less stressful. We will definitely hire him again next time we move! Fast and efficient! Definitely recommended to anyone!! Hardworking organised friendly top service I can highly recommend them. Was great arrived on time and beat the traffic very happy ! Absolutely amazing driver, friendly, polite, helpful and strong. Couldn't ask for anything more. Will be recommending to everyone. So kind & helpful, I strongly recommend him. There were too few blankets, I believe, and I saw no straps. I must add that I should have ordered a bigger van and Lee and his co-worker did a sterling job. The driver had to delay an hour due to a previous job, but he phoned apologetically a couple hours before and asked if it was ok to arrive an hour later. The driver was on time and got us to our new place without any hassle. Excellent service. They were extremely polite, respectful, helpful, carful with the items and efficient. Very happy with the survice I received. . Thank you! Fantastic service! Really friendly guys who got on with the job and didn't moan about all the stairs! They worked magic and managed to fit everything into their van, much to my surprise. Would definitely use them again. Wonderful help, knows what he is doing. Would recommend him wholeheartedly. Excellent service, fast, helpful and friendly. We had a really smooth move with Elyes. Would definitely recommend him and use him again. Driver was really prompt, helpful and friendly. Lee was gracious and very helpful, especially when it transpired that he was helping out more than he was expecting, through my own fault, I should have booked an extra pair of hands. Really good and happy with them. I tried being all smart and coming up with ideas/suggestions on how to pack, and they guys (rightfully) just looked at me and said "we got this". And they did. Carefully packed everything like Tetris, carried everything, and were overall super helpful. Displayed exceeding calm, patience and good humour under very unexpected and difficult circumstances during what was an eventful move! Brilliant, it all went very well, all done in time, and very respectful. Very kind, respectfull and helpful. Wonderfull service. Made it all so easy, moving can be so stressful. Most helpful and friendly. Would use him again. Arrived a bit late due to traffic and office access issues, but both driver and assistant were very helpful. I would highly recommend. Driver and helper arrived in good time and fitted everything in and completed the job in good time! Thank you Elyse and John???? The driver was competent and did a good job. However, he could have been a bit more careful to avoid possible damages to the furniture (only a couple of small damages). traffic was really heavy and they called to explain delay which was fine in my case. They were really helpful and helped me enormously to do everything within time frame and sort out the destination storage so there was room. there were some extra small items that they just handled without question. Very helpful and hardworking guys. Lovely man, great service, quick, efficient and especially helpful when I got to my new flat and found my key not working. Highly recommend. Thank you! Made the move so easy! I paid for his help, including the one flight steps per place and he barely left the van. He could be more friendly also. I am sorry to learn that you have left such a negative review. I'd like to take this opportunity to disagree with you as I had in fact carried out the job, only asking you for your assistance towards the end- given that you paid for 'help of the driver' meaning that I assist you. I can also appreciate that you feel I could have been more friendly, and I am sorry if I came across as unfriendly, I can assure you that's not the case. He went to the wrong address to start with and then found me when I heard my phone and spoke to him. CMV response: We do have a minimum 2 hour booking time which is clearly displayed on the website prior to booking. Made the move feel so easy! Would highly recommend. Very helpful and accommodating. Will use services again! Awesome! What a team: polite, diligent, hard working and professional. Hire them!!! Driver was late to pick up and then went to wrong drop off address so was very late delivering. The boys were good humoured, polite and really hard working. Thanks a lot! Would recommend! Father and son arrived on time, very, very helpful. Nothing too much trouble for them. They were friendly and very hard working. I would highly recommend them and would use them again. He was very helpful and efficient. Would recommend him every time!! Nice chap. Hardworking. Did not grumble about anything. Would recommend! These guys were amazing! Really quick, polite and efficient. Ive moved loads of times and these guys were the best I've used! Highly recommend! Excellent service, very quick, pleasure to deal with. Strongly recommend them! On time , prompt and helpful! Minor acceptable delay (7 minutes, I did not mind). Friendly driver, had interesting conversations. He was helpful with handling of my items and getting them to my house. Very professional service. Would happily use these guys again. The driver was very helpful at short notice and pleasant to deal with at all times after what had been a long day! Thanks, I'll definitely book again. Really lovely people and very efficient!! No nonsense guy but nice enough. Extremely efficient and worked hard the entire time. Really polite and efficient. Loaded and unloaded quickly really helped out. No complaints at all definitely recommend to future customers. Was very polite, chatty and helped even though he didn't have to. Would definitely recommend this service to family and friends. But very abrupt and cocky, but overall ok. It was a complicated move with hoists, windows removed etc and it was time critical for the van and driver - all went smoothly. Thank you. I estimated that the move would last 2 hours. But it was finished in an hour. May I be repaid the price of 1 hour? Excellent experience. The driver/mover was very helpful. Thank you. Extremely good work and very helpful, chatty driver. This is the first time I've used Man &Van service, it was a totally amazing experience, the driver was so very helpful, suggested ideas and totally professional. I would 100% use this service again. Thanks guys. That's the second time I've hired these guys and they were great both times! Many thanks. The Driver, Ellias was excellent, on time, friendly and extremely helpful. I would highly recommend his service. It was a great service provided by your driver.i am one happy customer.thank you. Elyes is a Great Man with character! Give him a lot of work.Thank You for help. I would like to say that my driver and his colleague was very helpful and friendly. I would recommend his service to anyone. Very positive experience from the moment I rang Man and Van to the delivery of my sofa. Thank you so much! thank you very good service and pleased with communication, van and helpfulness. All went very smoothly. A professional service; would use again. Very quick and efficient work, friendly and at drop-off point they put my items in the right rooms! Top service, fast, effecient, bang on time, nice guy. Really helpful and friendly guy. He really took the hard work out of moving my stuff. Highly recommend and will use him again if I need a man & a van!???? Very helpful and friendly. Would use again. Super driver. Very helpful. Recommended. He was great - on time, friendly, considerate of my things and a just nice bloke really! Use less idiot, never use them again. The job was carried out quickly and efficiently with no problems. Overall, this was not the best move I've experienced - though it wasn't a bad move. The driver spent the first 10 minutes telling me the stuff wouldn't fit and that I should've checked online for sizes. The stuff did fit, with room to spare. Can't have worse than this. Stay away from them. Elyes, my driver, was excellent. I needed a van in two hours and he could perfectly managed to arrive on time -unlike other companies-. He helped my partner and myself very kindly. The driving was supersafe. We were very happy with the service. Would definitely use again and recommend to everybody. Given that moving is supposed to be pretty stressful, we had such a nice driver, even at 9am in the morning he was on top form and we actually got everything done 2 hours earlier than I thought we would! Top service!! :) Thanks very much! Driver was one hour....and I write again ONE hour late...he didn't even seem to be sorry about it and because no parking was available when he came he wanted to leave and come later...we found it after 2minutes! He let my boyfriend do the hard job and after the heaviest boxes he waited for us downstairs while we finished to carry the rest of our stuff. Elyes was brilliant. Very helpful, knowledgeable and pleasant. Thanks very much. Good value a good experience. I would recommend. The driver has been very polite and helpful. I will use again for sure. Very friendly very helpful. Totally recommend. The driver was 50 minutes late without apology. He was chatty but was offensive and extremely rude about my job and made me feel inferior. Later into the journey he put his headphones in and listened to his ipod (although he had annoyed me so I wasn't overly bothered!) He dropped at least one box, didn't stack the boxes properly, didn't handle them with care and didn't offer to move my boxes into the flat (just loaded them into the lift). Overall, the only positive I have was that he managed to get me moved in within the two hours but I wouldn't use him again. The first allocated driver canceled and were not informed about that. Not a great attitude, paid extra in cash to help carry items up one flight of stairs as my husbands back is bad, but dropped things at the front door, so husband had to carry. Driver was a great help! The extra man that came to help the driver was lazy. The entire experience felt a little bit unprofessional. The driver was an hour late and very rude and not helpful at all. Driver was helpful and very friendly - really glad I chose this site! On time, helpful and great fun- perfect! Elyes was superb and incredibly helpful - I left a bag inside his van and he took the time in the evening to meet me and return it. Top man. Absolutely fantastic - the van was packed with ease and practicality, we ended up almost 2 hours ahead of schedule. Would definitely recommend, and will be using if we move again! Friendly and helpful. Would use again! i booked service that the driver will help me load and unload but he did not help us everything. Elyes arrived promptly and was really helpful. Our move went very smoothly. The driver arrived 10 minutes earlier, so he went To grab something To eat, Which made him Come eventually 30 minutes late. He was talking about other movings that he is doing that were Meant To happend during our moving Time. He was ignoring us the whole Time and was rude To everyone else In our building. Will never hire him again. These guys were fantastic! I just walked them through the furniture and boxes I was moving and they told me I could go grab a cuppa! They worked fast and efficiently, were very respectful of all my items, and a massive plus was that I genuinely enjoyed the hour and a half drive to my new place in the van with them. Touchwood I wont be moving again, but if I was I would 100% use these guys again. Incredible value for money. All work was done very quickly and efficiently, with a friendly smile. I would certainly recommend them. I wasn't there for the move but I asked my friends to help to make sure everything went okay and to help him get into both flats. Apparently the driver had trouble finding my flat for the pick-up point, but other than that he was quick and respectful to my friends which was great. Would book again if I ever needed to. I requested a man and one extra person. The driver was fantastic. Worked hard (and we really had some heavy furniture! And it was one of the hottest days in London this weekend!) was organised and very respectful of our property. I would hire the driver any time in the future. The extra person brought along was not good. He didn't know what to do, barely move anything and at times when he did things were dropped. I feel like I am being harsh but compared to the driver he was not that good. The driver called in another person to help which was really appreciated and the third person was really good as well. If this review was for the driver and the third guy it would be 5+ stars but the initial helper was not good and would recommend the seasons guy not being used again. A huge thank you to the driver and the third man that came to help it was a really hot day and some of our furniture was really heavy. One thing to note as well - I marked that the driver was late but he did call me in advance of the start time to let me know that he was sitting in traffic on the way. Excellent service and will use again for sure! The boxes I'd asked the driver to help me move turned out to be much heavier than I'd anticipated but he was really nice about it and helped anyway. Very patient also. Very nice driver and good service. Kind and respectful driver. Professional and very strong. Elyes arrived punctually and was super helpful from start to finish. Very professional. Can highly reccomend. The driver arrived over an hour late and was unapologetic. He left the van unattended as we were packing it. Overall very unimpressed. Absolutely amazing experience... My driver told me to go and have a cup of tea while he does the rest. I would definitely use this company again! Five star service. I just felt a bit rushed leaving the flat for hitting the road but otherwise all good!!! Excellent service. Highly recommend Elyes. Excellent service and timing. Was in the van and felt safe all the time. Great Job. Delightful father and son team. value adding - all and all great value for money with people I could trust. Excellent service and a good price. Would definitely use again. Great driver, very chatty, on time and professional. Would definitely recommend this to anyone.. Extremely friendly and nice father/son team. The night before I needed to delay my move by a couple of hours and he was very flexible about the scheduling, which was a really big help. I had a little dirt dragged into the flat with the move, but small price to pay for a very helpful, kind and trustworthy service. I would definitely use this service again!